Annalee Doll Description: Open eyes, mouth expression may vary, red top with green and white trim, green skirt and mittens, black boots, holds red basket filled with snowballs, snow base. Companions are 400516, 450516 and 450116. Annalee Doll Description: Open eyes, mouth expression may vary, red outfit with green and white fur trim, green mittens, black boots, holds wreath decorated with snowflakes, red bow and berries. Companions are 400916 and 450716. Annalee Doll Description: Open eyes, open mouth, red outfit accented with snowflakes, holly, green and white fur trim, green mittens, black boots, holds green bag with gift. Companions are 400816 and 450716. Facial expression may vary. Stunning piece! Annalee Doll Description: White chef hat, shirt and apron, red pants, red and white stripe apron with rolling pin and green towel in pockets, black belt and shoes, holds wisk and bag of "SUGAR - 50 LBS." Smaller companion is 400416. Absolutely stunning piece. A must for any kitchen or dining room! Facial expression may vary. 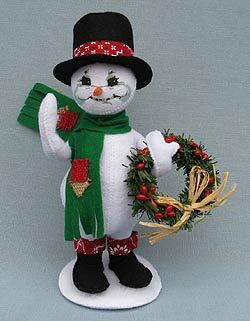 Annalee Doll Description: Open eyes, mouth expression may vary, white body, white hair, red Santa hat with white fur trim and holly and berries, green scarf with two patches, red bandana print shirt, black pants, holds brown shopping bag, green base. Companion is 600516. Annalee Doll Description: White body, white hair, red Santa hat with white fur trim and holly and berries, green scarf with two patches, red shirt, red bandana print skirt, holds package wrapped with brown paper - just like the old days. Facial expression may vary. Perfect gift for your female postal worker or mail carrier. Companion is 600416. Annalee Doll Description: Open eyes, mouth expression may vary, white body, white hair, red Santa hat with white fur trim and holly and berries, holds natural colored burlap sack with red and green patches, filled with candy canes, pine cones, red berries and sprig of pine. Annalee Doll Description: White body, white hair, white chef hat with red and white band accented with holly, green shirt, red and white stripe apron, holds a cookie with a huge white snowflake on top. Companion is 600816. Facial expression may vary. Annalee Doll Description: Open eyes, open mouth, white body, white hair, white chef hat with red and white band, red and white stripe shirt, red belt, green skirt, holds white basket filled with cookies. Companion is 600716. Annalee Doll Description: Open eyes, open mouth - as shown, white body, white hair, red and white stripe nightshirt and nightcap accented with holly and berries, lying on green base accented with a candy cane, holds pencil, writing "Dear Santa" letter. Annalee Doll Description: Open eyes, open mouth, white body, white hair, red and white Santa hat accented with holly, green shirt, red vest and pants, green belt with snowflake, holds sparkle snowflake ornament, white base. Companions are 600316 and 601116. Annalee Doll Description: Open eyes, mouth expression may vary, white body, white hair, red bow, green shirt, red skirt, green belt with snowflake, holds white sparkle strand of garland. Companions are 600316 and 601016. Adorable set of three. Annalee Doll Description: Tan body, red hat with green pom and accented with holly and berries, green scarf, red mittens, holds huge snowball. Why not make a Winter Fun display with mice sledding, ice skating, making snowmen and having a snowball fight! Facial expression may vary. Annalee Doll Description: Open eyes, open mouth - as shown, white chef hat, red and white stripe apron, green neckerchief, holds wooden rolling pin. Great house warming gift.